Question 1. Which of the following is a plant hormone? Question 4. What is the function of receptors in our body? Think of situations where receptors do not work properly. What problems are likely to arise? Question 5. Draw the structure of a neuron and explain its function. (iii)Axon where this impulse must be converted into a chemical signal for onward transmission. This information, acquired at the end of the dendritic tip of a nerve cell sets off a chemical reaction that creates an electrical impulse. This impulse travels from the dendrite to the cell body, and then along the axon to its end. At the end of the axon, the electrical impulse sets off the release of some chemicals. These chemicals cross the gap, or synapse, and start a similar electrical impulse in a dendrite of the next neuron. In this way information is exchanged in the form of electrical impulses from one part of the body to another through an organised network of nerves passing through spinal cord and connecting brain with others. Question 6. How does phototropism occur in plants? Answer. Plants show tropism in response to different environmental triggers such as light. 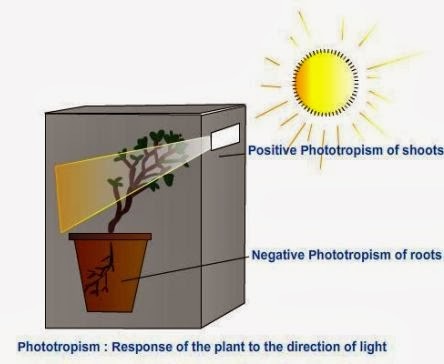 The directional, or tropic, movement towards the light or away from it is called phototropism. In phototropism, shoots respond by bending towards light while roots respond by bending away from it. Question 7. Which signals will get disrupted in case of a spinal cord injury? Question 8. How does chemical coordination occur in plants? Answer.In plants, stimulated cells release a chemical compound, know as plant hormones. These plant hormones used by multicellular organisms for control and coordination show a great deal of diversity. Different plant hormones help to coordinate growth, development and responses to the environment. They are synthesised and processed at places away from where they act and simply diffuse to the area of action. Question 9. What is the need for a system of control and coordination in an organism? Answer. In the living organisms, every change in the environment around evokes an appropriate movement in response by them. For example - falling of a bright light on eyes, touching of hot surface, exposure to cold weather evokes different reactions. When we want to talk to our friends in class, we whisper, rather than shouting loudly. And when in danger, we cry or shout. Hence, the movement to be made depends on the event that is triggering it. Therefore, such controlled movement must be connected to the recognition of various events in the environment, followed by only the correct movement in response. In other words, living organisms must use systems providing control and coordination. In keeping with the general principles of body organisation in multicellular organisms, specialised tissues are used to provide these control and coordination activities. Question 10. How are involuntary actions and reflex actions different from each other? Question 11. Compare and contrast nervous and hormonal mechanisms for control and coordination in animals. Answer. In human beings, the nervous system controls the various functions by well organised network of neurons. All information from our environment is detected by the receptors present in our sensory organs and transferred to brain and other parts through neural network in the form of series of electrical impulses and chemical changes. Question 12. What is the difference between the manner in which movement takes place in a sensitive plant and the movement in our legs? Answer. Movement in sensitive plant : Movement in sensitive plant takes place in leaves in response to touch. On touching, a stimulus is conducted to its base which triggers a decrease in osmotic pressure causing leaves to shrink. Leaves retain their position once the stimulus is over. This is a growth independent movement. This movement happens at a point different from the point of touch. So, information that a touch has occurred must be communicated. The plants also use electrical-chemical means to convey this information from cell to cell, but unlike in animals, there is no specialised tissue in plants for the conduction of information. Finally, again as in animals, some cells must change shape in order for movement to happen. Instead of the specialised proteins found in animal muscle cells, plant cells change shape by changing the amount of water in them, resulting in swelling or shrinking, and therefore in changing shapes. Question 1. Put some sugar in your mouth. How does it taste? Answer. The taste is sweet and is a combined perception of our sensory organs tongue and nose. Question 2. Block your nose by pressing it between your thumb and index finger. Now eat sugar again. Is there any difference in its taste? Question 3. While eating lunch, block your nose in the same way and notice if you can fully appreciate the taste of the food you are eating. Question 1. What is the difference between a reflex action and walking? Answer. A reflex action in living bodies, is an efficient ways of functioning in response to some situation without any thought processes under taken by brain.The thinking process of the brain is not fast enough to react against all situations. Reflex actions are controlled by the spinal arcs present with in spinal cord without the help of brain. Where as, walking is well thought of action by the brain, which involves planned and controlled performance of different body parts. Question 2. What happens at the synapse between two neurons? Answer. 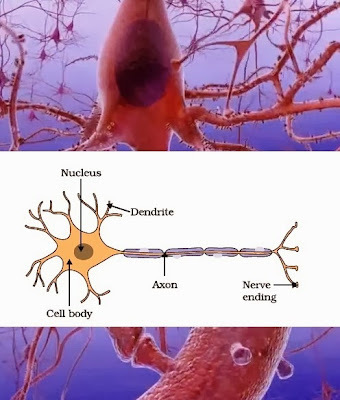 Synapse is the region of joining between dendrite and axon of two neurons, which plays an important role in in the exchange of the information in nervous system. The information, acquired at the end of the dendritic tip of a nerve cell sets off a chemical reaction that creates an electrical impulse. This impulse travels from the dendrite to the cell body, and then along the axon to its end. 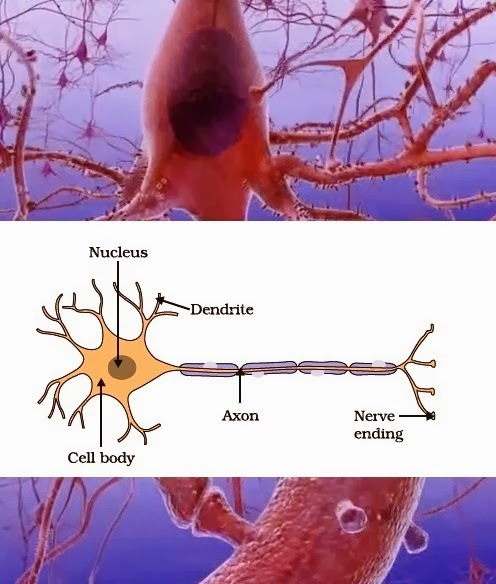 At the end of the axon, the electrical impulse sets off the release of some chemicals in the gap, or synapse, and start a similar electrical impulse in a dendrite of the next neuron. This is how nervous impulses travel in the body. Question 3. Which part of the brain maintains posture and equilibrium of the body? Answer. Cerebellum which is part of the hind-brain, is responsible for precision of voluntary actions and maintaining the posture and equilibrium of the body. Question 4. How do we detect the smell of an agarbatti (incense stick)? Answer. The smell of an agarbatti is detected through olfactory receptors by our fore-brain which is the main thinking part of our brain. It has regions which receive sensory impulses from various receptors. Separate areas of the fore-brain are specialised for hearing, smell, sight and so on. There are separate areas of association where this sensory information is interpreted by putting it together with information from other receptors as well as with information that is already stored in the brain. Question 5. What is the role of the brain in reflex action? Question 1. Have the old parts of the shoot and root changed direction? Question 2. Are there differences in the direction of the new growth? Question 3. What can we conclude from this activity? Answer. As Shoots are found bending towards light while roots are found bending away from it, we can conclude from this activity that shoots show phototropism and the roots show geotropism. Question 1. What are plant hormones? Question 2. How is the movement of leaves of the sensitive plant different from the movement of a shoot towards light? Answer. The movement of leaves of the sensitive plant are different from the movement of a shoot towards light. The leaves of the sensitive plant move very quickly in response to touch.There is no growth involved in this movement and is not directional. Where as the movement of a shoot towards light is caused by growth and is directional. Question 3. Give an example of a plant hormone that promotes growth. Answer. (i) In growing plants, light detection results in synthesis of a plant hormone called Auxin, at the shoot tip and helps the cells to grow longer. Opposite from the light side, auxin diffuses more towards the shady side of the shoot and stimulates the cells to grow longer on the side of the shoot which is away from light. Thus, the plant appears to bend or grow towards light. (ii) Similarly, gibberellins are another example of plant hormones which, like auxins, help in the growth of the stem. Question 4. How do auxins promote the growth of a tendril around a support? Question 5. Design an experiment to demonstrate hydrotropism. Answer. Plants show tropism in response to different stimuli. Hydrotropism is directional growth movements in plants caused by water. Positive hydrotropism can be demonstrated with germinated seedings, which are allowed to grow on ground. The soil under the roots is separated by a polythene partition. The left side is kept moist but the right side is kept dry. The radicals at first grow in downward direction due to the effect of gravity (positive geotropism) and light (Negative phototropism), but after some time, the roots bend toward the moist soil (Positive hydrotropism). This is evidently due to the affinity of germinating roots towards water. Question 1. Identify the endocrine glands mentioned in the figure. 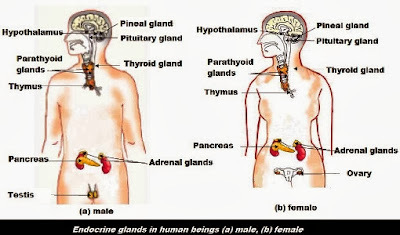 Some of these glands have been discussed in the text. Consult books in the library and discuss with your teachers to find out about the functions of other glands. Question 1. How does chemical coordination take place in animals? Question 2. Why is the use of iodised salt advisable? Answer. The use of iodised salt advisable because Iodine is necessary for the thyroid gland to make thyroxin hormone. Thyroxin regulates carbohydrate, protein and fat metabolism in the body so as to provide the best balance for growth. Iodine is essential for the synthesis of thyroxin. In case iodine is deficient in our diet, there is a possibility that we might suffer from goitre. One of the symptoms in this disease is a swollen neck. Question 3. How does our body respond when adrenaline is secreted into the blood? Question 4. Why are some patients of diabetes treated by giving injections of insulin? Answer.The patients of diabetes, who have inadequate levels of insulin produced by pancreas, are treated by giving injections of insulin. Insulin is a hormone which is produced by the pancreas and helps in regulating blood sugar levels. If it is not secreted in proper amounts, the sugar level in the blood rises causing many harmful effects.